INDIANAPOLIS, February 20, 2018 – Eli Lilly and Company (NYSE:LLY) announced today findings from a Lilly-sponsored, quantitative opinion survey, which found among those surveyed, people diagnosed with migraine experienced on average 15.4 completely pain-free days over the previous 30 days. The Migraine Impact Report also highlighted the impact of migraine on a person’s day-to-day-life, with respondents noting the symptoms of their migraine prevented them from doing what they wanted to do for one week (6.9 days) over the previous 30 days. Notably, the worst migraine pain ranked higher than that of childbirth among those surveyed who had experienced both (n=244, an average score of 8.6 compared to 7.3, on a scale of one to 10). Respondents diagnosed with migraine on average rated the worst migraine pain similarly to that of the “most painful thing I have ever experienced” (8.6 compared to 8.7), and higher than both the pain associated with kidney stones and broken bones (8.3 and 7.0, respectively). “As a practicing neurologist, I saw firsthand both the burden faced by people living with this often disabling, neurological disease, and the feeling that people must ‘power through’ their lives because those around them may not understand just how all-encompassing migraine can be,” said Sheena Aurora, M.D., medical fellow, Eli Lilly and Company. Migraine may impact a person’s career potential. 81 percent of respondents diagnosed with migraine agreed they wish they could do more to manage their disease, while more than half of those diagnosed with migraine (54 percent) agreed no matter how hard they try, they don’t feel they can manage migraine. Notably, nearly all those surveyed who have a family member with migraine (90 percent) agreed they feel “helpless” when their loved one has a migraine. For more information about migraine and resources available for patients, such as finding a doctor in your area, visit the National Headache Foundation website at www.headaches.org. The Migraine Impact Report is a 15-minute, online, quantitative opinion survey conducted by Nielsen on behalf of Eli Lilly and Company in May 2017. The survey was completed by 1,018 U.S. adults, including 518 people who have been diagnosed with migraine by a healthcare provider, 200 people who know a family member with migraine and 300 community members who do not know someone with migraine. Data for both people diagnosed with migraine and the general population were weighted to ensure representation from each group. Survey respondents were not restricted based on frequency or severity of migraine. Lilly has been committed to helping people suffering from migraine for over 25 years, investigating more than a dozen different compounds for the treatment of headache disorders. These research programs have accelerated understanding of this disease and advanced the development of Lilly’s comprehensive late-stage development programs studying potential treatments for the acute and preventive treatment of migraine. Our goal is to make life better for people with migraine by offering comprehensive solutions to prevent or stop this disabling disease. The combined clinical, academic and professional experience of our experts helps us to build our research portfolio, identify challenges for healthcare providers and pinpoint the needs of patients living with migraine and cluster headache. 1 Headache disorders. World Health Organization website. http://www.who.int/mediacentre/factsheets/fs277/en/. Accessed December 4, 2017. 3 Living with migraine. American Migraine Foundation website. https://americanmigrainefoundation.org/living-with-migraines/. Accessed December 4, 2017. 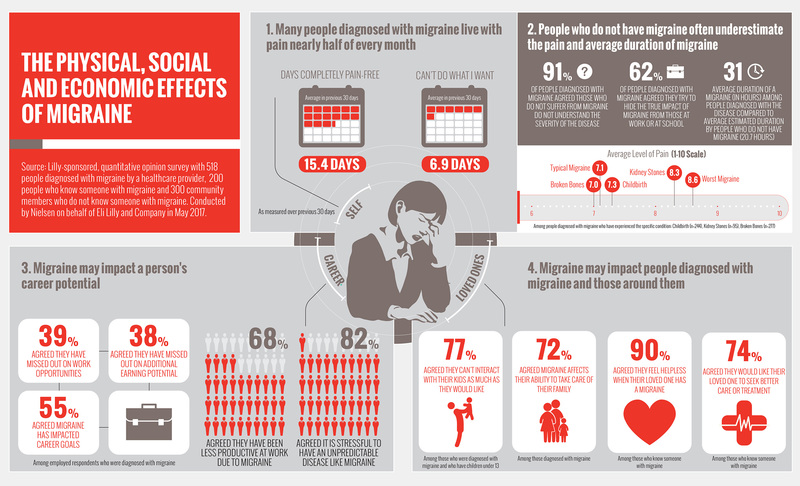 4 Migraine facts. Migraine Research Foundation website. http://migraineresearchfoundation.org/about-migraine/migraine-facts/. Accessed December 4, 2017. 5 Lipton RB, Bigal ME, Diamond M, et al. ; for the aMPP Advisory Group. Migraine prevalence, disease burden and the need for preventive therapy. Neurology. 2007;68(5):343-349. 6 Lafata, JE, Tuniceli O, Cerghet M, et al. The use of migraine preventive medications among patients with and without migraine headaches. Cephalalgia. 2010;30(1):97-104. 7 Diamond S, Bigal ME, Silberstein S, et al. Patterns of diagnosis and acute and preventive treatment for migraine in the United States: results from the American Prevalence and Prevention study. Headache. 2007;47(3):355-363. 8 Katic B, Rajagopalan S, Ho TW, et al. Triptan persistency among newly initiated users in a pharmacy claims database. Cephalalgia. 2011;31(4):488-500.